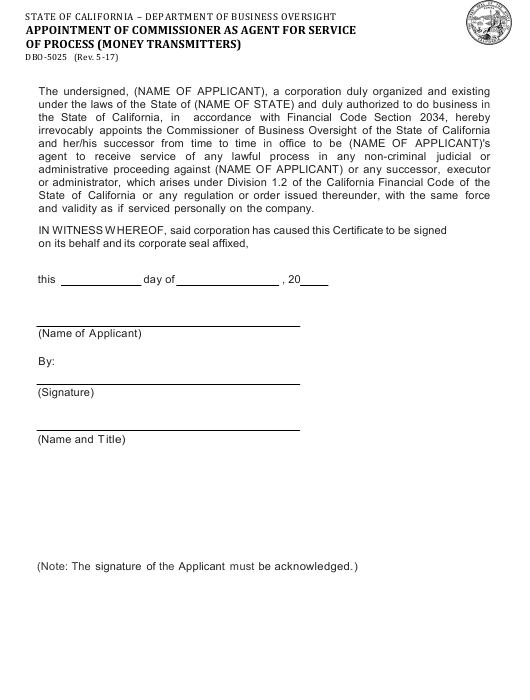 Form DBO-5025 or the "Appointment Of Commissioner As Agent For Service Of Process (money Transmitters)" is a form issued by the California Department of Business Oversight. Download a PDF version of the Form DBO-5025 down below or find it on the California Department of Business Oversight Forms website. and validity as if serviced personally on the company. applicable state and federal laws. driver’s license number, or financial information.  To another governmental agency as required by state or federal law.  In response to a court order or administrative order, a subpoena or a search warrant. 1515 K Street, Sacramento, CA 95814, (866) 275-2677.